The iPad Pro is the biggest iPad yet and (by Apple's own admission) the most exciting upgrade to the tablet since the first model appeared in 2010. With its Surface-like smart keyboard cover, some have said the super-slate heralds the end of the laptop era. If you're wondering whether it really is time to ditch your MacBook for this brave new world of portable computing, we've set out the advantages and disadvantages of the new iPad Pro below, in relation to the different set of features you're going to get with an Apple laptop. The benefit of a tablet has always been that it's thinner and lighter than even the most portable of laptops, but the dimensions of the new iPad Pro almost completely negate that: at 305.7mm x 220.6mm x 6.9mm, this is a full-sized laptop screen you're holding in your hand. 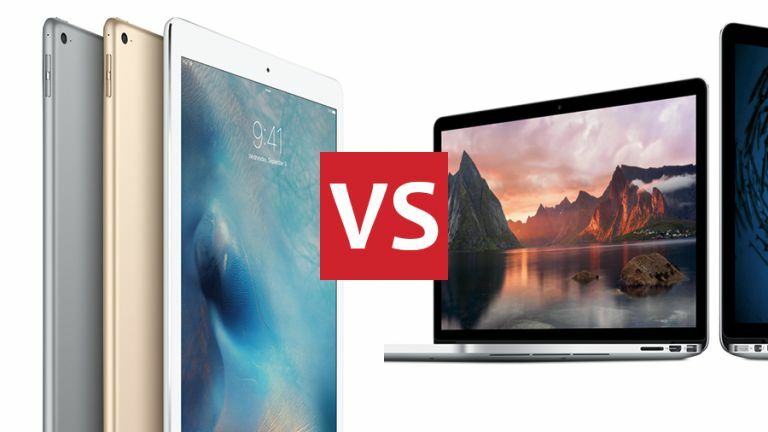 It weighs 713g compared to the 2015 MacBook's 920g, the MacBook Air's 1.08kg and the MacBook Pro's 1.58kg. You're not going to be able to hold the iPad Pro in one hand for very long and a bag to fit it in won't be all that different from an 11-inch laptop case. Of course it's still thinner and lighter than the MacBooks, but not by much, which is why so many people are comparing it to laptops rather than the other iPads. That said, the iPad Pro is still a more portable proposition than the 13-inch or 15-inch MacBook machines in Apple's line-up, and you have the weight of all those extra components to consider too if you pick a laptop. As far as size and portability goes, the iPad Pro still wins - but the difference isn't much. The architecture inside a tablet is different to that inside a laptop computer, so a straight comparison is difficult to make, but Apple hasn't been shy about promoting the iPad Pro's "desktop level" of performance. Thanks to the brand new A9X chip inside the gigantic tablet, Apple says, it's more powerful than 80 percent of the laptops shipped in the last year - even if a lot of those are low-powered models, it's still a bold claim. Based on leaked benchmarks we've seen on the web, the A9X is indeed a powerful chip, some 1.8x faster than the A8X inside the iPad Air 2 (again according to Apple's official figures). While a tablet might not have as much processing to do as a fully fledged computer, the iPad Pro offers smooth and snappy performance. With that in mind, the iPad Pro is bumping right up against the level of performance you get in the entry level MacBooks. For light web browsing, emailing, office apps, some basic gaming, photo editing and so on, Apple's new tablet is as good as its cheapest laptops. If you need some serious computing power - intensive image and video processing, for example - then a MacBook Pro is still your best bet. Of course one of the crucial differences between the iPad Pro and the MacBooks is the software they're running. You can't browse through files in Finder or run sophisticated desktop tools like Photoshop in iOS, but if you're happy sticking to one or two tasks at a time then it has enough computing power to keep most users happy. At the iPad Pro launch Microsoft was on hand to show off Office for iPad, which is a sign of just how far tablet devices (and iOS) have come - with a keyboard attachment and stylus there's no reason why you can't get work done on the iPad Pro, and there's easy access to all your photos, movies, television shows, music and so on as well. However, power users - who like to keep twenty browser tabs open at once and need to be editing video while checking spreadsheets - are going to want to stick with OS X on the MacBooks: it's more flexible, customisable and feature-rich than iOS. If you already have an iPad, try using it exclusively for a few days and see if the software lets you do everything you need to do as intuitively as you need to do it. The iPad Pro starts at $799 (we're still awaiting international pricing) and that compares favourably to the MacBooks, all of which cost more (and much more in some cases). If you're looking to do some computing on the cheap then the iPad Pro is an appealing proposition, but don't forget the Smart Keyboard is an optional extra that comes in at $169. The other key iPad Pro accessory is the Apple Pencil ($99), and with that impressive touchscreen to make use of the iPad Pro is a great device for switching between typing and other more creative tasks. No doubt third-party accessory makers will be bringing out plenty of extra add-ons of their own in the near future too. With the MacBooks you get fully fledged computers that can easily hook up to printers, hard drives, external monitors, speakers and so on (so can an iPad, but the process is usually not quite as straightforward). As with the software and the internal specs, the MacBooks are still the best choice for some serious computing - you need to work out what you need to get done day-to-day to decide whether or not it's time to ditch them.